During your wedding, there is one aspect in your whole beauty routine you need to weigh in on, and that is your lipstick. It can become super annoying if you have to stop and reapply your lipstick every time during your wedding. You need to find a lipstick that you can wear all through the event especially if it is going to be all day and night. While some people prefer using two different colors, one for the day and another for the night, you may prefer getting one color that will conveniently look good for the ceremony, the photos and also the dancefloor. If you fall within this bracket and do not want to look like a joke during your wedding day, here are the best long-lasting lipstick options you may use. The Smashbox Always on Liquid Lipstick, Out Loud is a liquid matte lipstick that is made to last for 8 hours without drying out your lips. The color does not budge, smudge or feather. The lipstick comes with a wide range of vibrant and highly pigmented shades together with an applicator that has a precision tip that perfectly lines and fills in the lips color. It comes with a very subtle slightly sweet scent that you can hardly feel. 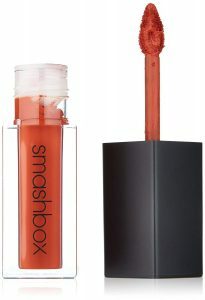 The Smashbox Always on Liquid Lipstick, Out Loud has a package made of a cuboid clear tube and a top black cap. You can identify the color of the product through the clear tube. The outer most packaging is of a black cardboard color with a stripe of a particular color code. The packaging has a very distinctive cuboid design with only the name of the brand on it. The Smashbox Always on Liquid Lipstick, Out Loud is a beautiful collection with different colors that are worth trying out especially if you want a long-lasting lipstick for a wedding. It is as well lightweight making it suitable to carry around. The lipstick is easy to apply and also to wipe off. It is comfortable to wear and worth every penny. The Wet n Wild MegaLast Lip Color, Bare It All lipstick is a neutral peach shade with a semi-matte finish. It leaves your lips feeling rich and creamy. You can get just enough color and warmth to last you for an entire day. The lipstick is made of a mix of pink and brown that works fabulously across all skin tones. You can wear the lipstick without any lip liner as it looks neat. It has an intense pigmentation effect on the lips. 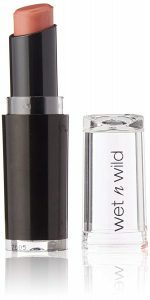 The Wet n Wild MegaLast Lip Color, Bare It All lipstick leaves behind a creamy and smooth feel on the lips. The matte lipstick has a beautiful sheen finish without feathering or bleeding. The lipstick can last for three to four hours on the lips. However, you would require to reapply it after having a meal. It has a bullet with a balm shape that comes in a plastic packaging made of a black bottom and a transparent cap to allow you to see the color. The bottom black area is branded with the name and the shade of the lipstick. 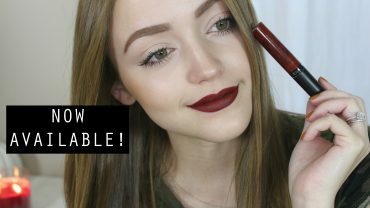 The Wet n Wild MegaLast Lip Color, Bare It All is a great shade for a majority of skin tones. It is closely similar to Mac Velvet Teddy. When you consider the price, you should get this lipstick. The stila Liquid Eye Liner can deliver a variety of eye effects from thin to thick lines. The liner does not bleed and works best over a shadow. It has a long nib that is easy to control. Even so, you need to have a firm hand to do so. It delivers a decent pigmentation, and it settles and dries quickly without transferring. If you are looking to create a visible second line you need to apply a second layer. The Liner lasts for a long time and does not budge throughout the day. It is as well water resistant. It comes in a sleek gold box package where inside you will find a simple back pen that has the name of the brand in gold lettering. The stila Stay All Day Liquid Eye Liner can deliver both thick and thin lines without smearing, smudging or leaving the skin wet. Regardless of the price it indeed is an excellent buy in regards to the quality it delivers. When looking for a good lipstick for your wedding, always think about the style you are looking to achieve and choose the shade that goes along with that style. Your lip color will play an essential role in selecting the color you want. Even so, you want to get a long-lasting product to reduce the amount of time you have to reapply. With the products listed above, you will surely not go wrong when selecting the lipstick that will make you look like the best version of yourself during your wedding day.